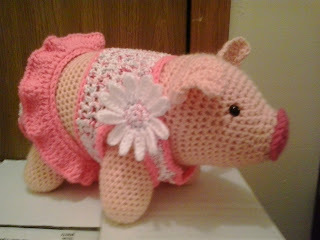 This is a pattern was a request from a co-worker because his girlfriend has been bugging him to buy her real live pig. He is hoping that this would work because he does not want to buy a pig. I personally think that he is afraid that it would get more attention from his girlfriend than he would if he got her the pig. The outfit was a request from him. It is optional. Worsted weight yarn: peach, passion pink, white, pinkalicious (Hobby Lobby – Crafter’s Secret Cotton), and pretty ‘n pink. Rd 3: (3 dc in next st, sc in next 3 sts) around. Change to peach. INSERT SAFETY EYES BETWEEN RDS 11 AND 12. THE LEFT EYE SHOULD BE BETWEEN AND COVERING THE DECREASES ON THE LEFT SIDE OF THE FACE, THE RIGHT EYE SHOULD BE JUST ABOVE THE DECREASES ON THE RIGHT SIDE OF THE FACE. Finish off leaving a long tail. Weave tail through sc of Rd 54, pull tightly and secure. Weave in ends. Rd 1: Working in front loops of Rd 3, attach passion pink, slip st in next 2 sc, ch 1, slip st in next sc, ch 1, slip st in next 6 sc, ch 1, slip st in next 5 sc, slip st in first slip st.
Rw 9: Ch 1, turn; sc2tog, sc in next 2 sts, leaving remaining sts unworked. Finish off leaving a long tail. Stuff LEGS firmly. Sew LEGS to BODY. Rw 8: Ch 2, turn; dc2tog, dc in next 7 dc, ch 2, skip next 2 dc, dc in next 7 dc, dc2tog. Finish off leaving a long tail. Sew Rws 1-3 to Rws 18-19. Weave in ends. Rd 1: Attach pretty ‘n pink in any Rw and using H hook, ch 1, sc evenly around LEGHOLE, slip st in first sc. Weave in ends. Repeat in second LEGHOLE. Rd 1: Fold SKIRT down and working both thicknesses of Rd 1 of SKIRT and Rw 1 and Rw 19 of PANTS, attach pretty ‘n pink and using H hook, ch 1, sc in each sc around, slip st in first sc. Finish off. Weave in ends. 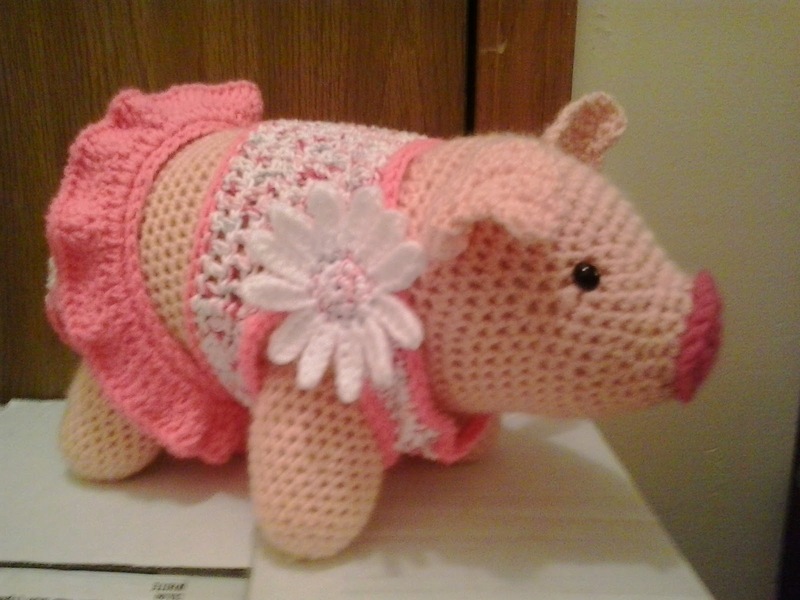 Place PANTS on PIG. Finish off leaving a long tail. Sew SHIRT PART 1 to SHIRT PART 2. Weave in ends. Rd 1: Attach pretty ‘n pink in any Rw and using H hook, ch 1, sc evenly around ARMHOLE, slip st in first sc. Weave in ends. Repeat in second ARMHOLE. Rd 1: Working in free loops of foundation ch of SHIRT PART 1/ SHIRT PART 2 and dc of Rw 8 of SHIRT PART 1/ SHIRT PART 2 and using H hook, attach pretty ‘n pink, ch 1, sc in each st and ch around, slip st in first sc. Rd 3: (ch 6, sc in second ch from hook, hdc in next 4 ch, slip st in next sc) 12 times. Finish off leaving a long tail. Sew DAISY to SHIRT.